FSP „GALENA" manufactures medicines and food supplements in strict compliance with GMP pharmaceutical guidelines to guarantee safe and high-quality products. Over 70 years of experience in the pharmaceutical market. 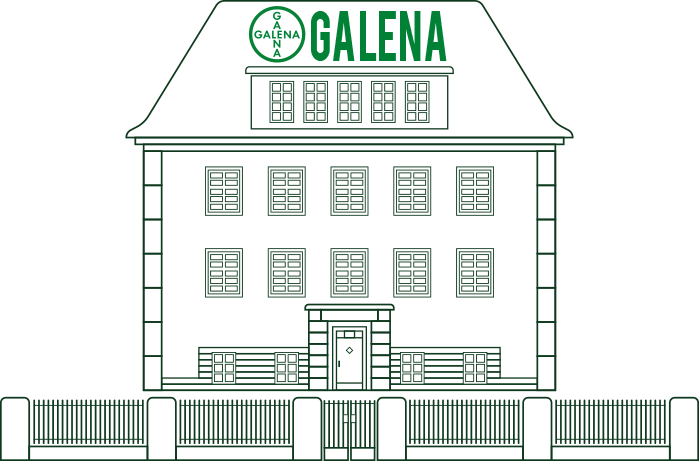 Farmaceutyczna Spółdzielnia Pracy „GALENA" has over 70 years of experience in the manufacture of medicines and pharmaceutical substances. We strive to maintain the highest standards in developing, testing, and manufacturing pharmaceutical products. We are committed to working in the best interest of patients and the physicians and pharmacists who recommend our products. This is why we constantly invest in developing our laboratories and production lines and in the professional development of our specialists. 1. The Personal Data Administrator is: Farmaceutyczna Spółdzielnia Pracy „GALENA", registered address: ul. Krucza 62, 53-411 Wrocław, registered in the register of entrepreneurs by the District Court Wrocław-Fabryczna in Wrocław, VI Commercial Division of the National Court Register, under KRS rumen: 0000025219, Tax ID (NIP): 8960002953, National Business Registry Number (REGON): 00040296800000. 2. With respect to your rights as personal data subjects (i.e. people to whom the data relates) and with respect to the mandatory rules of law, including especially the Regulation of the European Parliament and the Council (EU) 2016/679 of 27 April 2016 on protection of natural persons with regard to the processing of personal data and on the free movement of such data, and repealing directive 95/46/WE (General Data Protection Regulation), hereinafter referred to as GDPR, the Polish personal data protection Act (hereinafter referred to as the Act) and other relevant personal data protection laws, we commit to maintaining the safety and confidentiality of all personal data that you share with us. All our employees have been properly trained in personal data protection, and our company, as the Personal Data Administrator, has introduced new security measures, as well as technical and organisational means, in order to ensure the highest possible level of personal data protection. We have introduced appropriate procedures and policies to process personal data in accordance with GDPR, so that personal data processing occurs lawfully and reliably and you, as the persons to whom the data relates, may execute all your relevant rights. Additionally, if needed, we cooperate with the regulatory body within the territory of the Republic of Poland, i.e. the President of the Data Protection Authority (hereinafter referred to as PDPA). 4. The website www.galena.pl is used for information purposes only and does not collect any personal data. Our Website utilises the Cookies technology to match its functionality to your individual needs. Owners of other Websites will not have access to this data and information. If, however, you do not agree to personalisation of the Website, you may disable the Cookies in your Internet browsers. 5. To get in touch with us you may use the postal and e-mail addresses, as well as the telephone numbers listed on the Website. 7. The personal data is processed by our company as the Personal Data Administrator in order to provide you (i.e. the data subjects) services offered within the scope of our business activity. As per the rule of minimisation, we only process the categories of personal data that are considered necessary to achieve purposes specified in the previous sentence. 8. We shall process the personal data only for however long it is necessary to achieve said purposes. The personal data may be processed for a longer period of time only when the Personal Data Administrator is required by the relevant mandatory rules of law to do so, or when the provided service is continuous. 9. The source of the personal data processed by the Personal Data Administrator are the persons to whom the data relates. 10. Your personal data shall not be shared with any third country, as per the GDPR. If the personal data is shared with a third country, the data subjects shall be duly informed thereof, and the Personal Data Administrator shall utilise security measures, as per Chapter V of the GDPR. 11. No personal data is shared with any third parties without express consent of the person to whom the data relates. Personal data may be shared without the consent of the person to whom it relates only with legal public bodies, i.e. government and administrative bodies (e.g. tax offices, judicial authorities and other entities with a mandate stipulated by the relevant mandatory rules of law). 12. Personal data may be shared with entities that process the data on our request, i.e. on the request of the Personal Data Administrator. In such cases, as the Personal Data Administrator, we conclude a contract for personal data processing with such an entity. The processing entity processes the shared personal data solely for purposes specified in the aforementioned contract. It would not be possible for to conduct our business without sharing your data with processing parties. 13. The personal data is not profiled by the Personal Data Administrator, as per the GDPR. i) file a complaint to a regulatory body (i.e. to the President of the Data Protection Authority), as per art. 77 of the GDPR - if you believe we are processing your personal data illegally or in any way that violates your rights resulting from the mandatory rules of personal data protection laws. 16. Should you wish to exercise any of your abovementioned rights, please send us an e-mail to the e-mail address iod@galena.pl or contact the Data Protection Supervisor, as per point 3 above. 17. Each ascertained instance of security breach is documented, and should any of the events, as described by the GDPR or the Act, occur, the persons to whom the data relates, as well as the PDPA, if applicable, shall be informed of it.